Sick Leave Buy Back and the resulting pension spiking is finally being addressed (years late) Monday night. The law changed in 2012 to allow IMRF to penalize municipalities who practice pension spiking. Without doing another FOIA to IMRF, I believe the penalties Bloomington has paid are nearing $2,000,000. Monday night everything will be fixed. Well, not really. All that is happening is the City Manager will negotiate spiking with all the unions. Since union contracts normally cover 2 years or more, all those employees will still be spiking pensions for the foreseeable future. Every employee at the City does not belong to a union. The documentation says nothing about them. Do they get to keep spiking? Posted in BloNo, Bloomington, BLOOMINGTON CITY COUNCIL, Local, pensions, Progressives, Renner, Taxes.Tagged IMRF, penalties, pension spiking, sick leave buy back, SLBB, union contracts. 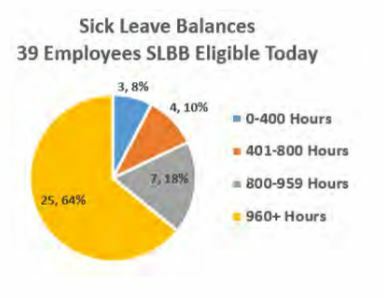 The documentation also says nothing about the sick leave which is deposited into HSRA. Health savings accounts are considered “income” and can be applied to final payouts thereby affecting pensions. There are a lot of details which seem to be missing. I thought it was reported that when Springfield changed their SLBB policy, they saved $1M+ Has Bloomington consulted with the Mayor of Springfield about implementing this change? The City Staff is always comparing Bloomington with other municipalities.